Tourism Kamloops recently hosted our Annual General Meeting at the South Thompson Inn on June 7th. The meeting was attended by the Tourism Kamloops Board of Directors and Tourism Kamloops team along with our voting membership which is comprised of the Kamloops Accommodation Association Board of Directors. Annual general meeting business was conducted including the presentation of Tourism Kamloops’ 2015 audited financial statements, discussion of the Municipal Regional District Tax (MRDT) renewal process, a year in review and look ahead as Tourism Kamloops undergoes transition under new leadership. Sincere thanks for their dedicated service was extended to Henry Pejril - Kamloops Sports Council, Cecilia Guerrero – Four Points by Sheraton as they have completed their terms. 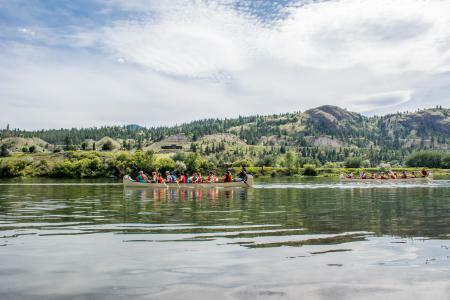 Following the formal business, attendees were invited to participate in a First Nations Canoe Experiences hosted and guided by Frank Antoine, Cultural Coordinator for Quaaout Lodge in partnership with Tk’emlúps te Secwepemc. A two hour paddle from the South Thompson Inn to the Valleyview boat launch allowed for historical commentary and First Nation storytelling along the shores of the South Thompson River.